Receptors are referred to as GPCRs because they couple to G proteins, and this association is essential for mediating the functions of these cell surface proteins. Importantly, G proteins produce the diversity of function of GPCRs by their ability to modulate activity of a large array of second messengers and cellular effector systems in cells [ 6] . The G protein superfamily consists of heterotrimeric complexes of distinct a, p. and y subunits with at least 18 Ga, 5 Gp . and 11 Gy subunits, capable of creating a very large number of distinct heterotrimeric complexes . The Ga subunits have been divided into subfamilies, Gas, G ai/Gao, G aq/Ga11, and Ga12/Ga13 based on similarities of function. Importantly, these different G protein heterotrimers have significant specificity both with regard to the GPCRs they interact with and the cellular effector systems that they regulate [6-9]. G proteins serve as a switchboard in creating the diversity of GPCR function [3, 10, 11] . Thus, each GPCR only interacts, in a natural manner, with a set array of G proteins (GPCRs can also be forced to interact with individual G proteins by over expression), and the G proteins have specificity in the second messenger systems they regulate. For example Gas is known to couple GPCRs to adenylyl cyclase to stimulate formation of the second messenger cAMP. In contrast, Gai mediates the inhibition of adenylyl cyclase by activation of a distinct and, in some cases, overlapping set of GPCRs. Furthermore, Gai is critical for other functions of GPCRs including modulating inward rectifying K+ channels (GIRKs) [12, 13] . Therefore, stimulation of the same receptor/Gai complex can lead to turning off the cAMP pathway and simultaneously inhibiting cell firing by stimulating GIRKs. 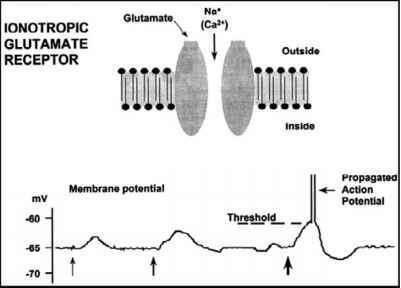 Similarly, Gao has been shown to link GPCRs to Ca++ conductance channels to regulate the influx of Ca++ to cells  . Gao provides further diversity in function because it can also link GPCRs to phosphoinositol phospholipase Cß, which hydrolyzes phosphatidylinositol 4,5 bisphosphate (PIP2) forming sn 1,2 diacylgycerol (DG) and inositol 1,4,5 trisphosphate (IP3). IP3 binds and opens endoplasmic IP3-gated calcium channels, causing release of bound calcium into the cytosol. Thus, the same GPCR coupled to Gao can modulate Ca++ influx from extracellular and intracellular sites to maintain Ca++ homeostasis. In addition to Gao, GPCRs also couple to another subfamily of G protein subunits, Gaq/Ga11, to regulate phospholipase C to increase Ins P3 and intracel-lular Ca++ release to active downstream regulators such as protein kinase C. Protein kinase C activation can then lead to modulation of the MAP kinase pathway  . This involves stimulation of Raf, Mek, and then MAP kinase ERK. MAP kinase ERK can then phosphorylate and activate transcription factors to change gene expression and produce long-term alterations in cell activity. In fact, ERKs may be a convergent target for activation of most GPCRs since cAMP-dependent protein kinase is also involved in regulating ERK, and therefore, those GPCRs that regulate the cAMP signal transduction pathway also modulate ERK activity. Furthermore, GPCRs acting via Gaq can also modulate activity of growth factor receptor pathways in cells including stimulation of the tyrosine kinase Pyk2 which can activate Src to cause phosphorylation and activation of the epidermal growth factor (EGF) receptor [ 16] . This intracellular pathway provides a mechanism for cross -[ alk of GPCRs and growth factor receptors. The fourth G protein subfamily Ga12/Ga13 has also been found to be important for GPCR signaling [ 17] . These Ga subunits are activated by GPCR stimulation and have been found to regulate the activity of RhoA GTPase. Through this downstream effector, Ga12/Ga13 can influence cell morphology, movement, and proliferation. Specifically, they have been found to affect neurite and axonal morphology and to be critical in regulation of migration of neurons in brain during development. These Ga subunits have also been implicated in the modulation of mitochrondrial function and cell apoptosis and their regulation, or dysregulation of p53 is likely to be involved in their control of cell proliferation, induction of metastasis and cancer, as well as other disorders. In addition to the alpha subunit, ßy subunits of the G proteins are also critical for GPCR signaling . Following a dissociation from ßy in response to GPCR stimulation, the ßy subunits are also able to directly interact with K+ and Ca-+ channels to regulate ionic conductance [ 9] . ßy subunits can also modulate the activity of phosphoinositol phospholipase Cß .Thus, following GPCR activation, both the a and ßy are released to modulate both overlapping as well as distinct enzymes and ionic conductance channels. This creates both the diversity of function of individual GPCRs as well as serving as an amplification process in cellular signaling. Importantly, because G proteins and second messenger systems are critical for the functions of GPCRs, they become critical components of assays used to study GPCRs and for GPCR drug discovery.